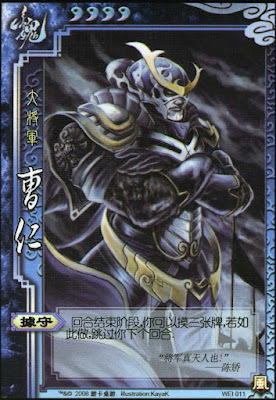 After his discard phase, Cao Ren can choose to flip his character card and draw three cards. Cao Ren uses "Entrench" after his discard phase, so he gets to keep everything that he draws. When Cao Ren uses "Entrench," other characters may be deterred from Attacking him, as he will likely have an Escape. "Entrenched" will net Cao Ren a grand total of three cards instead of the normal two cards that he would draw during his next drawing phase. Cao Ren's "Entrench" forces him to remove himself from the game and not help his team. There is no guarantee that he will draw the cards that he needs to survive two rounds when Cao Ren activates his ability. Cao Pi - Cao Pi can re-flip Cao Ren using "Exile" when he is damaged. Character card flipping is an on/off mechanism - if Cao Pi target's Cao Pi with his ability, he can allow him to play his next turn if he is flipped. Xu Sheng - Like Cao Pi, Xu Sheng can re-flip Cao Ren. However, this combination is not as favorable as it requires Cao Ren to be damaged by one of Xu Sheng's Attacks. Pang De/Lu Bu - These characters can be expensive to Escape their Attacks. Each character will cost Cao Ren to discard two cards to avoid damage. This can quickly negate the card advantage that Cao Ren gains from using his power. Ma Chao/Huang Zhong - These characters can force their Attacks to hit Cao Ren even if he has Escapes in his hand. Lu Su/Bu Lian Shi - These characters have abilities that can be used to remove cards from Cao Ren's hand and place them in other characters' hands. This can put Cao Ren at a disadvantage. King Cao Ren is not a good king. In order to win, he must have excellent loyalists to fight the rebels when he activates his "Entrench." Cao Ren is usually not a good loyalist - by using his ability, he removes himself from the game. When he is absent, there is not much he can do to help the king. If Cao Pi is the king, Cao Ren is a much better loyalist, as Cao Pi can re-flip him with "Exile." Rebel Cao Ren is not a good rebel for the same reason he is not a good loyalist - he removes himself from the game and cannot help his team as much when he is flipped. Spy This is Cao Ren's choice role, although this is not saying much. By removing himself from the game, it is easier for other characters to forget about him and not pursue him. As with the other positions, his weakness is that he removes himself from the game. A good spy should always be able to influence the game if one side gains an extreme advantage. If Cao Ren frequently activates "Entrenched," he may not be able to do this, but he can at least have a good chance of surviving until the end of the game. There are many great characters in this game, but unfortunately, Cao Ren is not one of them. He has very few options to seriously affect the game. It is only recommended to choose him if you are not serious about winning or if you are sure that Cao Pi is on your team. If you do choose Cao Ren, try to acquire the Wood Armor. With many cards in your hand, it will be difficult for enemies to deal fire damage to you.